Xihai (=west sea) is a large and deep canyon in the western part of Huangshan with impressive rock formations, views, peaks and steep rock walls. A set of trails and a cable car allow to do a loop around the canyon. 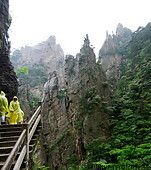 The trails consist of staircases which are either carved into the rock or attached to vertical rock walls. Xihai is the most scenic part of Huangshan.